The Universe is an amazing place ! Just how amazing is hard to comprehend sometimes. The farther reaches of physics – astronomy and cosmology in particular – deal with objects that are presented by scientists in a matter-of-fact way but which challenge one’s credulity if you stop to think about them for too long. Not only is the true exotica of astronomy – black holes, wormholes, multiverses, inflation, and so on enough to make your head spin but even more ‘ordinary’ objects in the sky, described in terms that don’t require any specialized knowledge to understand, sometimes tax one’s belief. 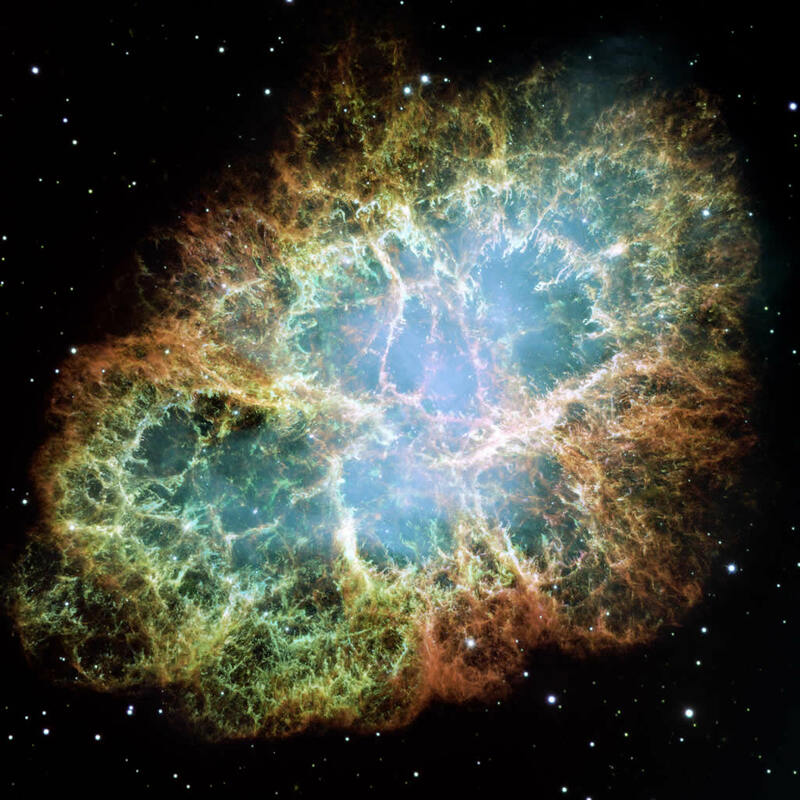 Take the Crab Nebula. This is a fuzzy patch, visible in a small telescope, which is the remains of a star that was observed to explode in ad 1054. Today (or rather 6,000 years ago, since that’s how long light takes to travel from the Crab Nebula to Earth) much of the star’s material is seen to be flying away from the centre at a speed of about 1,500 kilometres per second, and it has now reached a diameter of about 11 light years (100 million million kilometres). But that’s not the incredible bit. Large sizes and distances we can manage. It’s what’s at the heart of the Crab Nebula that will fry your brain. All that remains of the original star that exploded is what’s called a neutron star, in the centre of the nebula. This is twelve miles (about 20 kilometres) in diameter. That’s the diameter of London out to the suburbs, or the length of Manhattan from the tip to the Bronx. This star, a sphere, has a mass of about twice the mass of the sun. The sun has a mass of about 330,000 Earths. So we have to think about a sphere the size of London or Manhattan but weighing over 660,000 times the weight of the entire Earth. So far, so astounding. But now it turns out that this sphere is spinning, quite fast. In fact, the neutron star at the heart of the Crab Nebula completes 30 full rotations every second. So if you were standing, say, in Richmond Park, where the surface of the neutron star, transplanted to London, rotated past you it would be travelling at a speed of about four million miles an hour. Even this though is some way from the speed of light, about 670 million mph, but is still a pretty impressive rotational speed for an object as massive as 660,000 Earths. you would be sucked by gravity into its heart with such force that all the molecules of your body would be torn apart into their constituent atoms. The fact is, of course, that if you were standing anywhere near the surface of this neutron star, and you could withstand the heat and X-rays pouring out of it, you would be sucked by gravity into its heart with such force that all the molecules of your body would be torn apart into their constituent atoms. Still, at least you wouldn’t feel anything, since this would all happen before a pain signal had travelled more than a fraction of a centimetre along your nerve fibres.